Microsoft has revealed the Xbox One will only record the last five minutes of player gameplay footage compared to fifteen on the PS4. Arguably one of the cooler features being offered by the forthcoming next-gen consoles is their ability to capture and share the player's in-game footage. Both the Xbox One and PlayStation 4 offer this feature, building in a function that previous consoles could only do with the aid of special hardware. As with all things to do with videogames however, the question has to be asked of "which one does it better?" 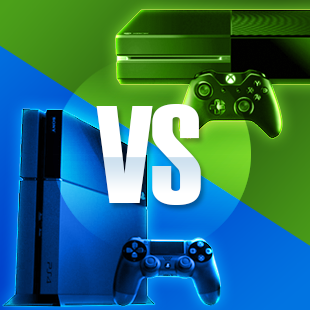 In terms of which console records the longest, the PS4 wins hands down. At any given time it will record and store the last fifteen minutes of ongoing gameplay, which players can opt to save and view as they please. Comparatively, the Xbox One won't make it nearly that long. "The last five minutes of any game you're playing are always being stored on your hard drive," said Microsoft Studios creative director Ken Lobb. Despite being a bit weaker in terms of its recording length, Lobb and Microsoft believe the Xbox One will bring other features to the table that will help the console surpass the PS4. The lynchpin of their argument, of course, is the Kinect. "Say you're playing online and you just did the best thing ever - you can't pause as you're playing online," said Lobb. "You can say 'Xbox, record that' and it'll grab the last 30 seconds of gameplay for you to play around with later." In addition to adding in exclusive voice commands, the Kinect will make it possible to add in things like voice overs that players can record while viewing their footage. While this isn't necessarily a huge advantage over the PS4, which will have its own editing tools, they're still the sort of thing many players might appreciate when uploading their latest Achievement to YouTube.